Basel Switzerland is a very picturesque city with old buildings, narrow streets and a lot of interesting history. It is known as an European culture center with over 40 museums, 25 theaters, operas and ballet and countless art galleries. If you’re interested in that kind of thing you could easily spend a few days here going from museum to gallery to museum. 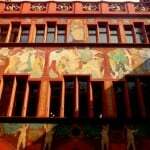 If this kind of thing doesn’t interest you, there are still quite a few things to see on your trip to Basel. You can also find many outside art sculptures spread out all over the city, and it’s nice to just walk around the city stumbling upon them. Basel in general is a really nice city to walk around in, especially in the old town. It is one of those cities that are nice to look at from afar. The best way to do this is to walk over the bridge to the other side (new town), where you can walk along the river, have an ice cream and take some awesome pictures. Then you can take the little ferry back to the old part of town again. We recommend when staying ANYWHERE in Switzerland to use a rental home. There are many great choices here for rental homes in Switzerland. Short History: The earliest documented citation of Basilia, the city at the bend in the Rhine, dates from the year 374. 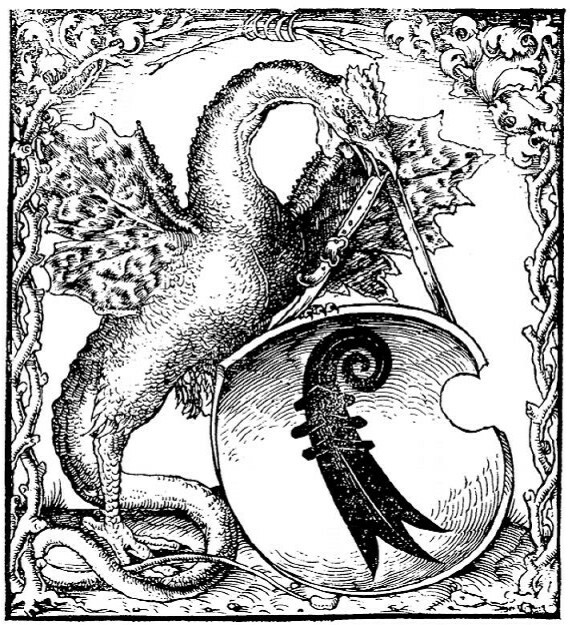 Basel’s heraldic animal, the basilisk, is certainly of more recent origin. It is a mythical creature, part cockerel and part dragon, which appeared for the first time around the year 450. The Basilisk holding Basle’s coat of arms can be traced back in heraldry to a monument reminding of the fatal earthquake in 1356 that completely destroyed the city. This is an amazing building, it really stands out with its vibrant red color, and the hundreds of years old painted details are pretty cool. It’s been there since the 14th century. Brings you back to the old days yet another time. You will find a great viewpoint of the canal from there! These little boats taking you across the river have been going for hundreds of years and are still today very popular and widely used. The boats are attached to cables so that they won’t get pulled into the strong currents. The ferryman actually puts the boat on a special angle so that the current pushes the boat across. 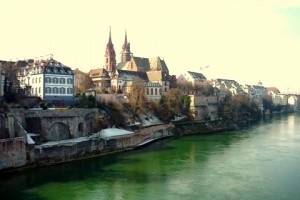 Going To The Three Corners Of Basel – Switzerland, Germany & France In One Day? The borders of Switzerland, France and Germany come together at the Three Countries Corner in Basel. The thought of being able to stand with one foot in Switzerland and the other in France is a pretty cool fantasy, but not that amazing in reality. We decided to take the chance of going to all three countries in the same day (Switzerland, France and Germany), but after the disappointing arrival in France we didn’t even bother to cross into the German border. No parades, no ‘Welcome’, no pass port check – nothing. Also I think we ended up in the most boring suburb of France ever, maybe if you would drive a bit further in to a nicer city it would be better. Yeah, it would have been cool to say that you went to three countries in one day, but the place we ended up in on the French part across the border was just SO dull! I think it would be awesome to go to France for a croissant breakfast, Germany for a typical German lunch (a descent bratwurst if you like), and dinner in Switzerland. And I bet I’m not the only one who thinks so, but all we found on the French side of the border was a Chinese restaurant, and back on the Swiss side the first (and only) restaurant around was an Indian one. The only main difference really was that the houses looked very different, not at all like in Switzerland, and everyone spoke French – all the sudden the prices had also changed from Swiss franc to euro. Nearly everything (shops, supermarkets, cafes etc.) is closed on Sundays in Basel (and Switzerland). The only supermarkets which you will find open are the high-prices ones in the central train station. Even the restaurants are closed, however you will find that the street-side Kebab shops are still open, thank god. Swiss people work like maniacs during the week but when it’s the weekend, they take it seriously. The same goes with their lunch breaks. There are trams going basically everywhere, and like everything else in Switzerland they’re very punctual. All hotels in Basel, including the youth hostels, offer each registered guest a free “Mobility Pass” upon check in. This gives free unlimited travel in Basel and suburbs (including to and from the airport) for the duration of their stay. This is easily worth the price of a lunch every day you stay. If you have written confirmation of a hotel reservation you can also use this to travel from the railway station or airport to your hotel. At least one respected hotel in Basel advertises this fact on their web site. This saves you 8 franc per day. The Swiss train system is the best I’ve ever experienced. The trains are fast, smooth and punctual, and all the stuff that is usually difficult when traveling by train is easy here. It can be really expensive traveling with train in Switzerland, but they have countless of great deals and bargains, so you can actually get around really cheap if you ask them about it or read more on their website. 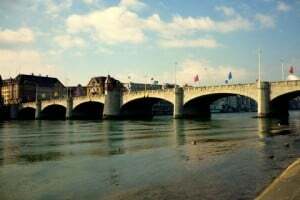 There are two train stations in Basel, the German station (Badischer Bahnhof, BBF) on the northern part, and the Swiss/French (SBB Bahnhof) in the city’s south. If you get to Basel with a national train it stops at the southern station. From there trains to Zurich and Geneva leave every hour. Euro Airport works as the airport for all three corners, both Basel (Switzerland), Mullhouse (France) and Freiburg (Germany). The budget airline Easy Jet flies from here. The hostel is a part of HiHotels, so for those who are members the rooms are cheaper. If you’re not a member you have to pay 6 franc extra. It’s in a great location, only 3 minutes away from the train station, the rooms are clean, you get free linen, free towels and they offer a descent free breakfast, which is good since eating out is expensive in Switzerland. The earliest documented citation of Basilia, the city at the bend in the Rhine, dates from the year 374. Basel’s heraldic animal, the basilisk, is certainly of more recent origin. It is known as an European culture center with over 40 museums, 25 theaters, operas and ballet and countless art galleries…one of the most glamorous places to visit in Europe. If it’s in the winter, go skiing, Swiss style. This is an amazing building, it really stands out with its vibrant red color, and the hundreds of years old painted details are pretty cool. It’s been there since the 14th century. Brings you back to the old days yet another time. You will find a great viewpoint of the canal from there! No parades, no ‘Welcome’, no pass port check – nothing. Also I think we ended up in the most boring suburb of France ever, maybe if you would drive a bit further in to a nicer city it would be better. Mobility Pass: All hotels in Basel, including the youth hostels, offer each registered guest a free “Mobility Pass” upon check in. By Train: The Swiss train system is the best I’ve ever experienced. There are two train stations in Basel, the German station (Badischer Bahnhof, BBF) on the northenrn part, and the Swiss/French (SBB Bahnhof) in the city’s south. If you get to Basel with a national train it stops at the southern station. From there trains to Zurich and Geneva leave every hour. 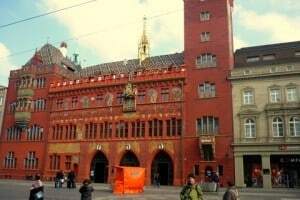 We like staying at Youth Hostel Basel City – mainly for the fact that it is right next to the central train station, so arriving and leaving is easy. Thanks for the warning note that most establishments are closed on Sundays. Switzerland seems like a really amazing place. We are sailing into Basel on a Viking Cruise. This is our last stop and are planning on staying a few days in Switzerland. The cruise line wants to book us into a hotel in Lucerne. Would that be better than Basel? Yes I think you should book your hotel in Lucerne, it’s even nicer than Basel!